When our loved ones with dementias and Alzheimer’s Disease reach the part of the journey through these neurological diseases where they are unable to handle their own financial and legal matters, we as caregivers have no option but to step in and act for them and in their best interests. Here in the United States, there is an incomprehensible aversion to planning for the possibility of having to entrust our lives to someone else and for how we want to die. It’s as though we have this national collective mentality that if we don’t think about it, then it won’t happen. The bad news? No matter what, it’s still going to happen. And someone is going to be left holding the bag – maybe the person we would have designated or maybe someone we don’t want making decisions for us – to decide for us. If it’s a person we trust, then they have the agony of trying to figure out what’s best and what we would have wanted. This is especially agonizing when dealing with end-of-life issues. Too many people in this position of not knowing what we want, because we refused to talk about it, prolong our suffering and run up needless bills in the process, simply delaying what would have been the inevitable outcome anyway. If it’s a person we don’t trust, all bets are off. And it is not going to be pretty. The time to prepare for both of these inevitables – unless we die early and truly unexpectedly (I can’t help but laugh every time I see an obituary for a really elderly person that says they died unexpectedly: suddenly, perhaps; unexpectedly, no) – is when we have the ability to and can make sure what we want to happen happens. From the standpoint of appointing someone we trust to handle our financial and legal affairs (most of us do an okay job with medical powers of attorney, but even that gets ignored more than it should), a revocable living trust is probably the best and safest way to go. It, with the professional letter declaring incompetency, is the only documentation needed for the designated trustee to handle finances and legal matters. A revocable living trust is probably the easiest way to ensure what we want both in life if we can’t do it ourselves and in death after we’re gone. However, it is of supreme importance to choose wisely and be absolutely convinced of the trustworthiness of the person we designate to be our trustee. The bottom line? If we have any doubts as to whether we can trust someone completely, we do not choose them as our trustee. It will not end well for us – in fact, it could end gruesomely and tragically – and all our careful planning will have been for nothing, to put it mildly. But what if, as many Americans do, our loved ones with dementias and Alzheimer’s Disease reach the stage where they are not competent to handle their affairs without any legal documents in place? There are two options, and by the time this is needed, it’s likely that the petitioner (us for our loved ones or our families for us) will need both of them granted. Both options are very costly (much more expensive than the cost of powers of attorney and a revocable living trust), often take a long time to be granted, and, in many cases, set off a family war, which not only can delay a decision, but can also create irreparable rifts within the family. One option is guardianship. Guardianships give the petitioner the legal authority to take physical care of the loved one who is incapacitated. 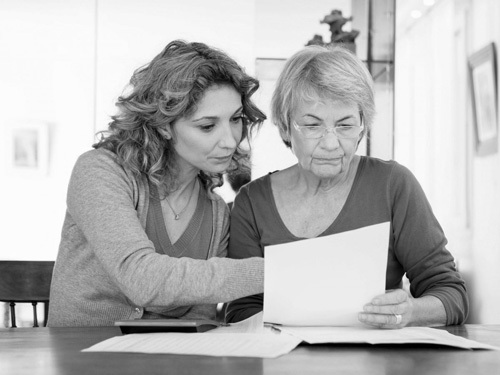 The process to obtaining guardianship begins with getting a professional letter confirming the person for whom guardianship is sought is incompetent to handle their own affairs. That letter must be taken to an attorney to have a petition drawn up to submit with the letter to the court. The petitioner is responsible for all the attorney fees (general estimates are in the $2500 to $4000 range if the petition is uncontested) and court costs. The court will decide – slowly – whether to grant the guardianship and the entire process can take several months at the very least. The second option is a conservatorship. A conservatorship gives the petitioner the legal authority to handle financial and estate matters for of the loved one who is incapacitated. A conservatorship has the same legal requirements and process as a guardianship and has the same potential problems as well. That’s why if a petitioner has no other choice but to pursue these options, it’s prudent to do both of them at the same time. There is an additional requirement for the petitioner who is granted a conservatorship for a loved one who is incapacitated. The petitioner will have to file a detailed annual financial report for the estate to the court for review to ensure that the estate is being managed as the court sees fit. If the petitions for guardianship and conservatorship are uncontested, they will take a much longer time and much, much more money to obtain than having an attorney draw up a revocable living trust that settles everything. 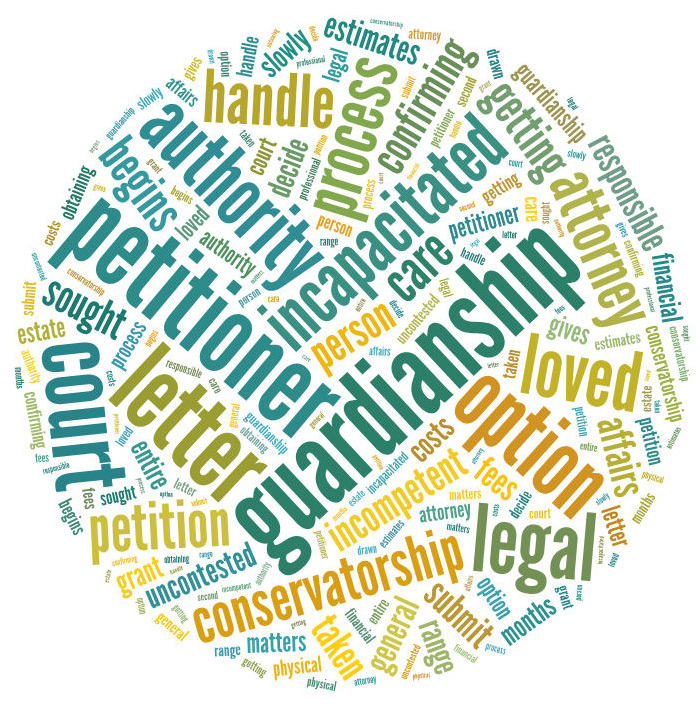 If the guardianship and conservatorship petitions are contested by other family members, it’s conceivable that the legal fight could outlast the loved one who is incapacitated and the amount of money spent to fund the fight would be outrageously high. We may have no choice in these matters with our loved ones that we are caregivers for, but I urge each of us to consider taking care of these things for ourselves now for our potential caregivers. We need to tell our families what we want, carewise, for longterm care and at the end of our lives. We need to choose and discuss with the person we want to ensure that our wishes are carried out. We need to get the legal paperwork done and keep one copy in our home safe or a safety deposit box at the bank and give the other copy to the person we designate to carry out our wishes. We never know when time and chance are going to happen. Today is the day to prepare for that. Tomorrow may be too late. "The Year of Lear: Shakespeare in 1606"